A late afternoon fire heavily damaged a home in the Pennypacker Park section of town on June 13th. Willingboro Firefighters, along with firefighters from neighboring towns, were dispatched to 72 Pageant Lane at 4:17 pm. The Burlington County 911 Center received several calls reporting heavy black smoke coming from the rear of the home. While responding to the incident, Chief of Department Burnett reported seeing a large column of black smoke in the air. Chief Burnett and Deputy Chief J. Clark arrived on scene at 4:19 pm, and reported a two story home with black smoke coming from the rear. The Deputy Chief requested "All Companies In Service", signifying a major fire. Engine 1613 and Ladder 1615 arrived two minutes later. 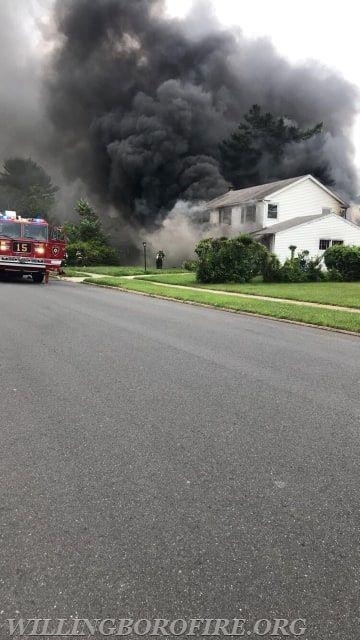 The chief took over as Command, the Deputy Chief became Operations, Engine 1613 connected to a hydrant on Peartree Lane, and Ladder 1615 took a position in the front of the home. Engine 1613's crew pulled a 1 3/4" hoseline to start extinguishing the fire. Crews from Cinnaminson, Mount Laurel, Westampton, Moorestown and Delran started to arrive on scene to assist with extinguishing the fire. A 2 1/2" hoseline was also being used to help extinguish the fire. Due to the rapid spread of the fire, and the house being confirmed as vacant, all crews were removed from the home. The fire had spread throughout the first floor, and had made it's way to the second floor and attic. With the use of several hoselines, the fire was able to be placed under control at 4:49 pm. Once a large amount of fire was extinguished from the outside, crews were able to enter the home with the hoselines to completely extinguish the fire, and confirm that nobody had been trapped inside. Firefighters from out of town were being released by 5:25 pm. There were no injuries as a result of the fire. A fire investigation was conducted by the Burlington County Fire Marshals Office. Firefighters from Delanco and Riverside were standing by at Willingboro Fire Headquarters incase of any other emergencies in town. All units were clear from the scene at 9:28 pm.